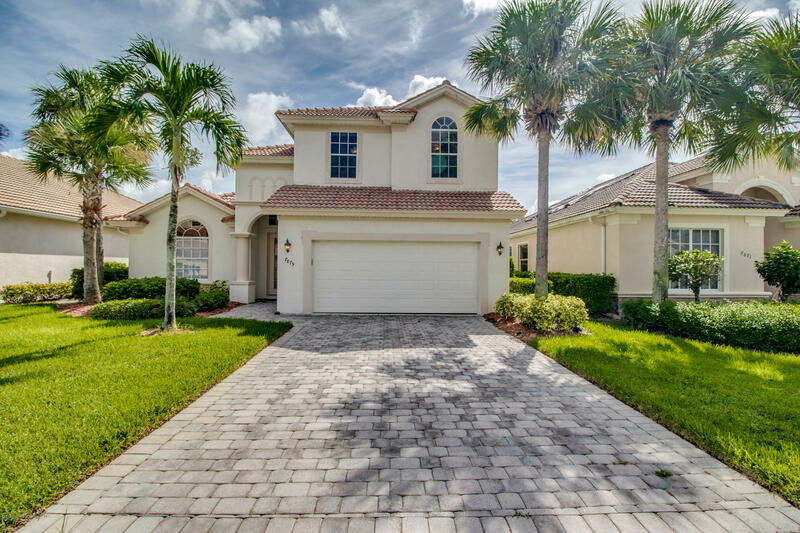 Impressive 3 Bedroom 2.5 Bath Pool Home backs up to one of the 6 beautiful lakes located in the Madison Park Community in Naples. Brick paved driveway and walkway leading to covered front entrance. Great Room Plan with Stunning views of Lanai & Pool with Spillover Spa. First Level Master Bedroom with New Carpeting, Tray Ceiling & Sliding Glass Doors to Pool Area. Master Bath with Double Sinks, Garden Tub and Step in Shower. Kitchen with Stone Counter tops, Breakfast Bar, Tile Back Splash and Stainless Appliances. Dining Area with Sliders to Pool Area. Half Bath on First Level. New Carpeting in all Bedrooms, Stairs and Loft. Loft with Tray Ceiling overlooks Great Room. Splendid view of Lake. Full bathroom on Second Level along with Second and Third Bedroom. I am interested in 7875 Founders Circle, Naples, FL 34104.